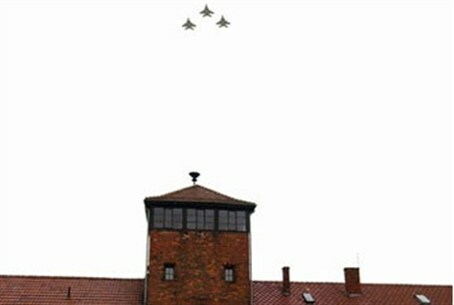 IDF Website remembers historic moment when three IAF F-15s flew over concentration camp. 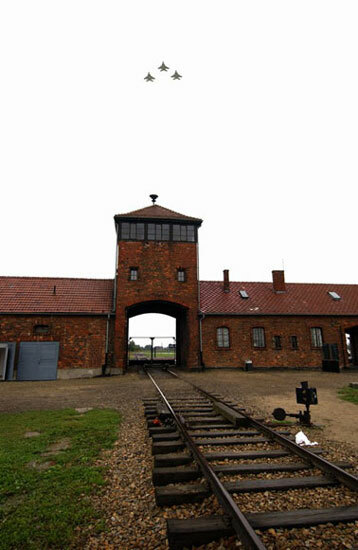 On September 4, 2003, the Israel Air Force carried out a ceremonial flight over the Auschwitz-Birkenau site in Poland. Three F-15 jets took part in the sortie, flown by six aircrew members whose relatives had been murdered in the Holocaust. On board the jets, the crew members carried Yad VaShem witness pages with the names of Jews who were murdered on the same date, 60 years earlier – September 4, 1943. One of the pilots was Maj. Gen. Amir Eshel, who was recently appointed to head the IAF. Another pilot was Brig. Gen. Avi Maor, formerly commander of the Ramon Air Force Base. "I decided that this would be the most proper way [to visit Poland]," he told the IDF Website, "because it represents the state of Israel and the Jewish people in a different way. Not just 'what was done to us' but presenting the national strength and the fact that Israel is a strong state with a strong army." The jets took off from the Polish Air Force base at Radom. When they flew over Auschwitz-Birkenau, Delegation Commander Eshel spoke on the radio: "We, the Air Force pilots in the skies of the camp of horrors, rose up from the ashes of the millions of victims. We carry their silent cry; we salute their bravery and promise to protect the Jewish nation and its land, Israel." On the ground below, 180 officers and NCOs under Maj. Gen. Ido Nechushtan, whom Eshel is now replacing as IAF Commander, watched them. "The day of the flight was crazy," Maor recalled. "In the pre-flight briefing, we sat in the cold and shivered. To be honest, I think that the trembling was not from the cold, but from excitement over what awaited us on that fateful day." "From the moment of takeoff everyt5hing was very technical, just like any flight. Only a year later, in a meeting we held, we discovered that we had all had the same experience right after flying over Auschwitz. We were in twin-seater planes and we usually talk a lot during the flight. That second, we all went silent. A thunderous silence, as if something heavy had fallen through the air and we all understood exactly how great the occasion was." Maor flew his last IAF flight two weeks ago. Looking back at all his career flights, including combat flights in which he shot down enemy jets, "I have no doubt that this was the most meaningful and successful flight in my life."